Wise words but Andre, as you may have guessed, wasn’t from these shores. Rather, he was a much respected, French born wine merchant and wine writer who made England his adopted home. He charismatically led the English wine trade for the early part of the twentieth century and has an annual wine writing award named in his honour. Simon died in 1970 just as wine in the UK was beginning its, slow and still ongoing, journey to become a drink for all. In the 1970’s, more and more people travelled abroad for the first time and many returned with a taste for wine. In those early days, the wine world was still highly elitist and people were, understandably, nervous and intimidated when buying or drinking wine. 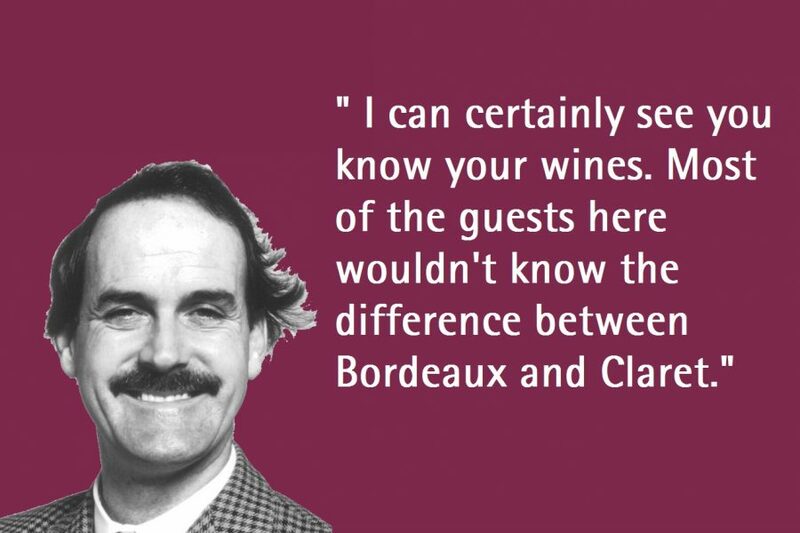 John Cleese, wine lover and avowed enemy of wine snobbery, recognised this and, brilliantly, sent up ill-informed and overbearing wine buffery in the guise of his most famous creation. If you don’t get it, don’t worry, just pop into the shop and I’ll explain. In the shop, the Fawlty quote is always the most popular with customers but there are lots of other thoughts from the great and good on display amongst the hundreds of wines. Wine, it seems, has been inspiring and causing reflection since time immemorial. Proving that nothing ever changes is this quote from Ancient Greek playwright, Aristophanes, ‘Quickly, bring me a beaker of wine, so that I may wet my mind and say something clever.’ I’m sure we’ve all been there! In a similar vein but from a surprising source is Martin Luther’s, ‘He who loves not wine, women and song remains a fool his whole life long.’ Who’d have thought the catalyst for the Protestant Reformation was quite so frisky? Of course, it’s not all fun and frivolity. More cerebrally, esteemed poet, John Milton, felt that, ‘Wine, one sip of this will bathe the drooping spirits in delight beyond the bliss of dreams. Be wise and taste.’ Sound advice indeed from the author of Paradise Lost.